With vol. 43 of Edition Staatskapelle Dresden, the Sächsische Staatsoper Dresden now turns its attention to a double CD set of light classics. 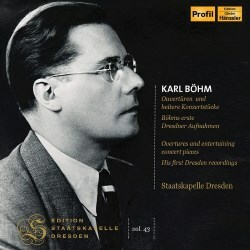 Karl Böhm’s lengthy association with Staatskapelle Dresden, established in 1934, despite interruptions ended with his last concert with the orchestra in 1981. When Böhm died in 1981, just shy of his eighty-seventh birthday, the music world lost a major figure in the Austro-German tradition that included such renowned conductors as Karl Muck, Wilhelm Furtwangler, Erich Kleiber, Clemens Kraus and Bruno Walter. In 1931 Böhm was appointed music director at Hamburgische Staatsoper, serving until 1934 when he left for the prestigious position at Dresden. As general music director at Dresden, Böhm grabbed the opportunity to succeed Fritz Busch. Although not Jewish, Busch was ardently opposed to Nazi ideology. Considered politically unsuitable by Hitler’s National Socialists, he had been subject to a hostile and humiliating dismissal from his Dresden post. Böhm conducted almost seven hundred opera performances in 1934-1943, a period considered a golden age for Dresden by many music historians, although one unshakeably linked to the Third Reich, from which Böhm significantly benefited. This complicity with the Nazi regime is an emotive subject that still adversely affects Böhm’s reputation today. Böhm became one of an exclusive group serving as general music director of both the Sächsische Staatskapelle Dresden and the Sächsische Staatsoper Dresden concurrently. Writer Michael H. Kater has described Böhm taking the Dresden post as “extreme career opportunism at the expense of personal morality”. Incidentally the first Staatskapelle Dresden recording session was in 1923, conducted by its then general music director Fritz Busch, whom the Nazis would remove in 1933. Böhm conducted recordings for EMI (notably its German Electrola label) during the period 1935-1949 in Dresden, Berlin, Vienna and latterly in London. During these years Böhm sealed his reputation as one of the foremost conductors of Austro-German repertoire and was widely recognised as a specialist in Mozart, Wagner and Richard Strauss. The twenty-five works contained here were recorded in studio conditions at Semperoper Dresden, with the exception of the two Albert Lortzing pieces which were recorded in April 1935 at Electrola Studios, Berlin. These Electrola shellac recordings were produced during 1935-1940 prior to the introduction of magnetic tape. We are told that the set contains all the light classics recorded during this period except Johann Strauss II’s The Blue Danube. As the title of the set suggests, all the works here are what could be described as easy listening, mainly overtures, marches and waltzes. In 1937 Electrola started to focus its recording activities on “very safe choices”, bestselling popular classics of a short playing time that could fit easily onto a record. Its catalogue containing this type of work had been mainly recorded by Staatskapelle Berlin conducted by Leo Blech. Blech was Jewish, so those works were removed from the catalogue of the German label. This large gap in the catalogue of its bestselling recordings had to be filled with recordings by conductors considered suitable by the Nazis, a policy of which Böhm was a major beneficiary. By 1938 Electrola’s catalogue did not contain any recordings by Jewish conductors. Every work on this double set is strikingly played, and afforded the level of integrity as if playing a Beethoven symphony. One senses a meeting of minds between the conductor and orchestra with entirely successful results. There are four works that I especially enjoy hearing. The Leonore Overture No. 3 from Beethoven’s opera Fidelio is a sombre work infused with despair yet full of drama that Böhm drives to an especially exultant conclusion. The excerpt from Tchaikovsky’s Capriccio italien has a significant effect. Right from its reveille-like trumpet opening, the action-packed writing is exhilaratingly played. Enduringly popular, the Intermezzo from Mascagni’s opera Cavalleria Rusticana is given a meltingly beautiful performance that Böhm paces satisfyingly and obtains a glorious sheen from the Dresden strings. In Weber’s overture to his opera Der Freischütz, Böhm creates a particularly dark and sinister soundworld with shafts of light gradually illuminating the gloom. The amount of drama Böhm generates is remarkable. As one would expect from recordings produced in the period 1935-1940, these recordings do have considerable surface noise which becomes especially noticeable in the quieter passages. However, Holger Seidler’s remastering has achieved remarkable results, ensuring there is little of the usually encountered glassy-sounding strings and sour or vinegary winds. In addition, the sound production is pleasingly even. Brought up on digital sound, I usually shy away from older recordings with problematic sound, but the sound quality of these performances is remarkable for their age. I feel able to listen to the music easily without the sound distracting me from the actual performances. I notice that all these recordings are contained on the 19 CD set Karl Böhm – The Early Years – 1935-49 on the Warner Classics ICON series (review). However, in my opinion the Warner sound quality is not to the same standard as this Profil set. As usual in this lavish Edition Staatskapelle Dresden series on Profil, the lavishly produced booklet contains several essays, always an informative read, and several interesting photographs. Also included in the booklet is a comprehensive list of the recordings complete with the Electrola matrix numbers. On CD two, the track listing is incorrect: there are fourteen works not thirteen, making twenty-five in all. For the past seven seasons in Dresden, I have attended concerts and operas performed by Staatskapelle Dresden. Like any other admirers of this orchestra, I relish this ongoing Edition Staatskapelle Dresden series, such a fertile source of recordings containing that recognisable Dresden sound. Not just appealing to the specialist collector, this collection of remarkably well performed popular light classics on Profil provides an absorbing insight into the recording development of the world-class orchestra, Staatskapelle Dresden under Karl Böhm.